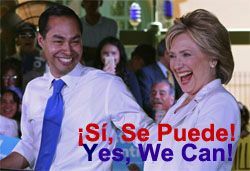 Housing Secretary Julian Castro endorsed Hillary Clinton today. They spoke at joint rally in San Antonio to enthusiastic crowds. Hillary and Castro have been building ties for a while now. He's often been mentioned as a potential VP choice for her. At the 2012 Democratic Convention, he spoke the same night as Michelle Obama -- I thought: "Michelle Obama was good but hands down, the star of the night was Julian Castro. Definitely a winning combination in my book.